Significant progress has been made in the last 4 months. In fact, you can download a prototype version of Astro-Slug right now! I will now go through the progress I’ve made so far. If you don’t want to read through my gibberish, you can read the changelog at the bottom. I’ve added movement, so now you can move! Movement includes walking (or whatever snails do) and jumping. Ral can now shoot! Those pesky aliens won’t stand a chance against his new laser eyeglass-thingy. Lasers can be shot up, right, left, and diagonally. 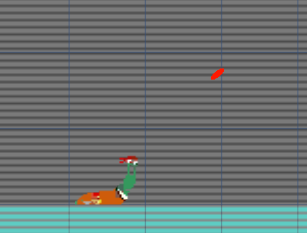 Some prototype enemies have been made. All they can do currently is walk and shoot. However, they are sure to strike terror into the citizens of the galaxy. The image being used for the prototype enemies is that of the Drex, a cybernetic organism usually employed as guards for the ICUP (Intergalactic Confederation of United Peoples). Be careful, because a health system has been added. Now Ral and the enemies actually die when shot. Feel free to ask questions or leave comments below.